Ever since she was a toddler, Stacey Irvine has eaten little else but chicken nuggets and the occasional portion of chips. Now, at the age of 17, she has been warned by doctors to change her appalling diet or die. The factory worker – who says she has never tasted fresh fruit or vegetables – had to be taken to hospital earlier this week when she collapsed after struggling to breathe. Doctors found that her 15-year ‘chronic chicken nugget addiction’ has left her with anaemia and inflamed veins on her tongue. So deficient was her body in vitamins and nutrients that she had to be injected with them. 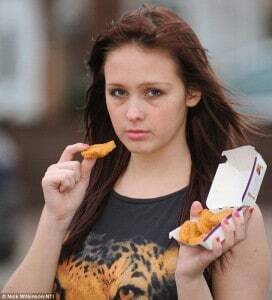 Although she has been urged to drastically change her diet, she says she cannot give up the fast food. Stacey, who is recovering at home on a high-dose course of vitamins, has been hooked on chicken nuggets since her mother let her try them in a McDonald’s restaurant at the age of two. The teenager, of Castle Vale, Birmingham, admits she will occasionally vary her food intake – by eating a slice of toast for breakfast or a packet of crisps. Nutritionist Dr Carina Norris said that, during her ten years of experience, she has not come across such an extreme case of food addiction. She believes Stacey’s diet will have serious long-term health implications, as her body will be lacking iron, calcium, antioxidants, vitamins and good fats. ‘She should view her health scare as a warning – a wake-up call that she needs to drastically change her diet. ‘Fruit and vegetables are integral to long-term health. Without them, you greatly increase the chances of developing chronic conditions such as heart disease and cancer. The article goes on to explain the problems of both a monotonous diet as well as a die of strictly chicken nuggets and I just… I just hope they can help her. Lots of side-eyes being delivered to some of the stuff in the full article, though. I’m just being real. Weekend WTF: Eat Your [Powdered] Vegetables! She looks older than 17. I think the mother was wrong. When I was growing up there was no such thing as, “I don’t want to eat that.” If I didn’t eat what was put on the table, then I didn’t eat, period. My mother didn’t have time to cater to a child. I don’t think any child is so strong willed that they will starve to death. To me it sounds like the mother just didn’t want to deal and took the path of least resistance. The parent needs a swift kick in the neither regions.